Laramide Resources Ltd. holds a 100% interest in the Murphy Uranium Tenements in the Northern Territory of Australia (the “Project”), which it had previously been exploring under a farm-in agreement. 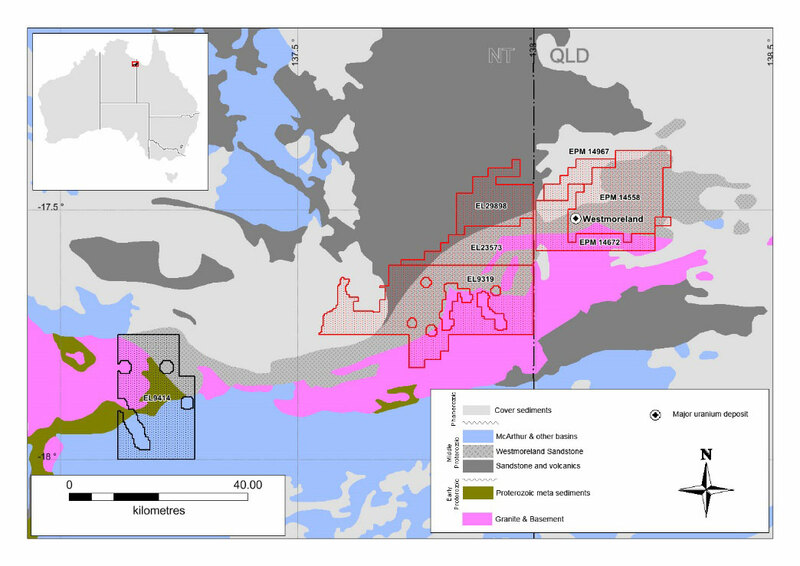 The strategically located Project consists of 683.5 km2 of granted exploration tenure, which lies contiguous to and along strike from Laramide’s Westmoreland Project in northwest Queensland. The Project will enhance Laramide’s dominant landholding in a highly prospective and underexplored uranium province. The Northern Territory of Australia is a jurisdiction that is supportive of both uranium development and mining and hosts several well-known deposits including the Ranger Mine which has produced in excess of 120,000 tonnes of U3O8 over a 35-year period. The Murphy acquisition is structured to incentivize a return to active exploration on the Project while providing former joint venture partner Rio Tinto Exploration Pty Limited with an opportunity to participate should a world class discovery be made. The Project is situated geologically within the highly prospective Murphy Uranium Province. The Murphy Uranium Province produced high-grade uranium during the 1950s and stands out amongst the world’s attractive underexplored uranium provinces, having not seen any meaningful exploration since the 1970s (see press releases July 16, 2018 and November 6, 2018). The Company has completed the acquisition of high resolution Falcon Airborne Gravity Gradiometry (“Falcon AGG”) over the contiguous Queensland and Northern Territory tenure highlighted in Figure 1. Figure 1 – Now 100% Laramide tenements covered by Falcon AGG (red outline). The Westmoreland exploration model involves targeting mineralisation associated with chlorite and haematite alteration confined by large fault systems and in association with intrusive dykes. Structural information is key in target development. The Falcon AGG survey will provide structural information by highlighting basement architecture and faulting including those which may penetrate the sedimentary package and hence be conduits for mineralising fluids. The Survey may also enable the mapping of alteration associated basement features and structure and mapping of the location and extent of volcanic units and intrusives.